sixoldgeezers > Categories > 2015 > How many fish does the lake lose during a flood? Can you guys who were around in 07' or have seen this happen to other lakes estimate how many fish either go over the spillway when it reaches 640, or are going through the gates now with water being released. I wonder if more fish are near the dam bc of the water clarity and moving water, or they are still in mid lake? Are they smart and strong enough to swim up current and not be swept away when water is let out or will they just flow with the water eating where the food is. This question pertains to all fish, but mainly striper. I don't know much, I just know that bigger fish were harder to come by in the years following the flood. My personal best until 2010 was 8lbs. I began fishing the lake regularly in 2005. I did not exceed 8lbs until 2013 when I caught a 12lb fish. I've caught 8 over 10lbs since then. Tens of trillions of fish.. minus a couple trillion, still means trillions left. I did not see that much of a change after the 07 flood. Now, bait kills have wiped out large numbers but flooding....I don't think so. Neither do the guides I work with. Bait kills and then the skinny fish dying later in the summer because of a lack of food. That's the real danger. I think the timing of the flood has a lot to do with how many are lost to the river. I'm not a biologist or Texoma expert. But with the timing of the flood being May a lot of the fish have been in spawn mode and in the post spawn mode. I would think they do this primarily in areas a long ways from the dam area. So hopefully it has helped that a lot of the fish were still out west and north. Sure we lost some fish but IMO nothing that will decimate the striper population. A flood in late June and July would probably cause more fish to end up in the river. I do think the river below the dam will be the location for some great fishing this summer. It will be crowded but there will be some hogs caught on the river. If you have the ability to catch shad and get on the water in a boat it will be there for the taking. I would think the egg's from spawn would definitely have a much much lower chance of survival, but have done no research on the topic. I took this pic at the possum kingdom dam. There were big white splashes going down the flow and some oldtimers there said that was fish. Not sure if that was true, but if so PK is losing a ton of fish. 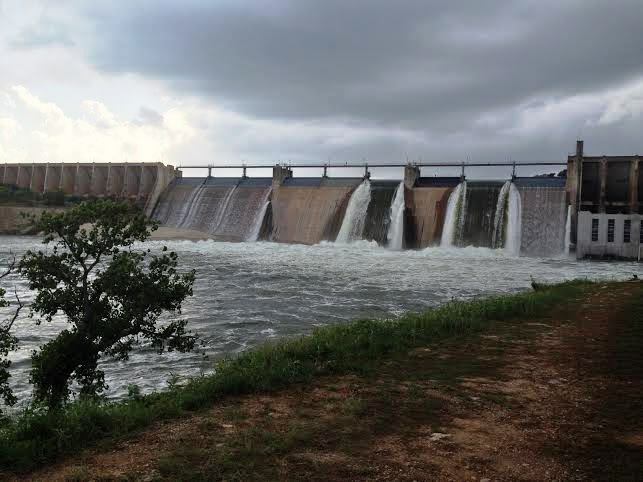 The spillway at Texoma will provide a much easier path for fish to follow. Fish normally follow current. I know that when the stock ponds on the farm flooded there was always fish stuck in the small holes in the little branch below that were easily caught by me or the racoons. No way of really knowing how many are lost downstream until we get the 2015 Gill Net Survey and compare along with Matt Mauck's thoughts. Bright side is to think of all the thousands & thousands of fish that are normally caught every day during this time that are still swimming around. My concern is not so much the number of fish being lost but rather how much bait is going downstream with the flow. As Paokie said, the gill net surveys in 2015 will give us a scientific hint as to how the lake sustains this flood. In my opinion when the lake returns to a somewhat normal level, the cast nets being thrown by the guides and all other fisherman who use them to catch bait along with the electronics used to find it will give us a hint on how the bait population was effected which as James stated, is probably a more critical factor for losing fish. While there are differences between this year and 2007, these charts show that 2008 Texoma fishery was still in good shape. Hopefully, we will be in great shape later this year and in 2016. The shad kill in 2010 had a much bigger effect on fishing the following year. I bet fishing will be OK once we get on the lake. The lake is basically closed to fishing pressure and likely will be for quite some time. That might make up for the ones that go over the spillway.